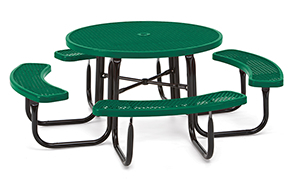 Bring guests in from all parts with a round picnic table made from steel. Revitalizing seating areas with outdoor tables can create new market opportunities and deliver long on guest enjoyment. Constructed from commercial grade steel, this classic table design with diamond pattern is time-tested strong and economical. The all MIG welded 1-5/8"O.D. frame is reinforced with a 1"O.D. support brace with UV stabilized powder-coated finish. The convenient walk-through table design offers easy enter and exit access to the bench seat. Tables are standard made with a 1-9/16" I.D. umbrella hole—umbrellas sold separately. Universal access model is available. Wheelchair and Mobility Device access round outdoor tables conform to current ADA specifications/requirements.